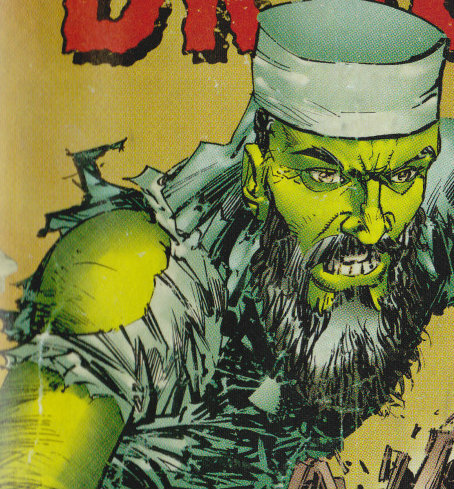 Other Distinguishing Features: Green skin, turban, and long black beard. After Osama Bin Laden is killed by the U.S. government his body is dropped into the ocean. Over a long period of time his body simply drifts away and eventually finds itself in the waters of Japan. Due to a large tsunami a chemical plant is destroyed causing radioactive material to spill into the ocean. This material comes into contact with Osama’s body turning him into a giant green rampaging mindless monster. Eventually, he finds his way to New York City where Angel and Malcolm are visiting. After the battle does not go in their favor Malcolm comes up with an idea to lure Osama into the ocean. Helicopters blaring Whitney Huston music lead Bin Laden into the ocean where he is hit by a barrage of missile from U.S. jet planes. His body is blown into dozens of pieces.